We had all the kids over last Sunday to celebrate our oldest son's birthday. So we barbequed and I threw together a bunch of finger foods to munch on. One, was this Chocolate Raspberry Pastry. It was so simple to make, very quick to put together and the best thing--it's low in calories! A winning combination in my book. 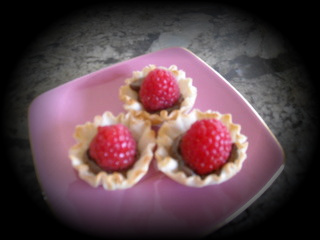 I started with some mini fillo (phyllo) pastry shells that I found in the frozen section of my grocery store. Then I used some Hershey Bliss candy. Since I couldn't decide which would be better, I made two kinds, milk chocolate and the milk chocolate raspberry. I cut them into quarters and put two pieces of candy into each pastry shells. I baked them for 5 minutes at 350 degrees. When they came out of the oven I popped a raspberry on top. Voila! Your done and total calories per treat = 34 Trust me, they were worth it! Oh my gosh, these look so good, and I bet they taste great. I love the fact that they are so low in calories so there will be no guilt involved with this dessert. It will be the next dessert I make. Yum. They are delicious. And you're right no guilt involved! You can't go wrong with these little treasures. Thanks for visiting.